Fujizakura Heights Mugen is a 5.5% rye beer, also known as roggenbier, from Fujizakura Kanko Heights, based in Yamanashi, Japan. It’s part of their draft range and first came out in 2017. If the name sounds funny, it’s because Fujizakura Heights Mugen is supposed to be a play on words. As it was explained to us “Roggen (which means rye) contains the syllable “ro”, which can represent six in Japanese, as in Roppongi (six trees). In turn, the counter for six is mu, as in mutsu – 6 things. This then became mugen, as in the name of the beer. Whoever thought Japanese wasn’t funny should be rolling the aisles now. As an aside, it’s also Fujizakura Kanko Heights first effort to make a speciality beer using rye malts. It also contains Cascade and Hersbrucker hops as well. The brewers behind Fujizakura Heights Mugen must be so proud of their comedic skills. After spending a good few minutes “laughing” at the story about how this beer was named from one of the servers at Tap x Tap it was time to drink. 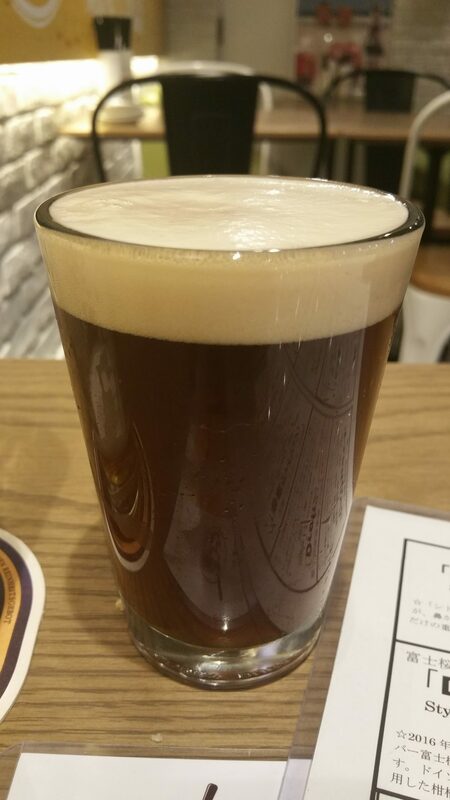 Rye malt is notorious a pain to brew with, Baird Brewer’s Nightmare Rye IPA by Baird Beer is one example of how much trouble it causes, and rye beers are few and far between in Japan. So to get another one to add to the collection is always welcome. Fujizakura Heights Mugen came out a deep muddy brown colour, with lots of haze on the beer – not yeast though it could have been something left over from the brewing process. The head was a fluffy, slightly off-white colour that lingered for a while, leaving a frothy residual head on the side of the glass as the beer went down. Then comes the spicy peppery rye malts. They are unmistakable and delicious. Hints of bananas and cloves also came through, which could mean this is a rye weizen, but then that would be just confusing to try and fit a pun around. For want of a better word, Fujizakura Heights Mugen is delicious. It had so much going on the body that I regretted buying only a half pint of it, so I immediately ordered one to take away for a friend. Fujizakura Heights Mugen had lashings of rye peppery flavour, and paired well with the bananas and cloves. There was only a mild amount of sweetness to it, nowhere near enough to become cloying or stop you from drinking lots. Fujizakura Heights Mugen finished off with a spicey flourish and was light enough to keep on drinking continuously. Now if only I had ordered a pint of it, I would have been truly happy. I bought some of this to take to a friend to try – that should really sum up how I feel about Fujizakura Heights Mugen. Wonderful.